To you, tomatoes may simply add color to your plate, but to Amador Castellanos and his vanpool group, tomatoes are what get them up in the morning. The day starts early for Amador and the workers who ride with him to the fields. They must begin picking tomatoes by the time the sun comes up. Their commute in a CalVans vehicle does not stay within California’s San Joaquin Valley where Amador lives, but continues from there to the Salinas Valley where the tomatoes are being grown. 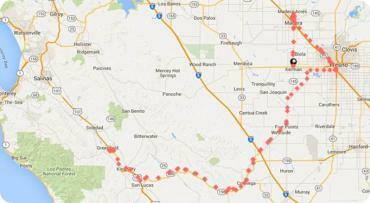 Amador hits the road at 3 a.m. to pick up his fellow vanpoolers. 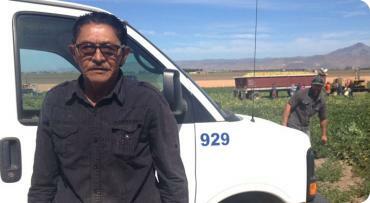 He travels from his home in Kerman to Madera, where he picks up most of his fellow workers. They continue from there to the city of Greenfield. This three and one-half hours, 180-mile route takes them south from Madera, through Coalinga and across the mountains to arrive at the tomato fields. After six to eight hours of work, Amador repeats the journey to return home. You might ask why farmworkers living closer to Greenfield don’t pick the tomatoes. It is because the tomatoes picked by Amador and his fellow vanpoolers are special or fancy tomatoes that command a high price. If not picked and handled properly, these tomatoes can lose much of their value. Picking them requires a skill set found in workers living in Madera, hence the long trip. Amador doesn’t complain. 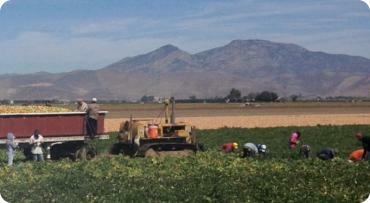 The work pays well and the air in the Salinas Valley is much cleaner and cooler. Also, having steady work in this time of drought is something to be appreciated, as many farmworkers have been laid off due to the lack of water. So, the next time you visit a nice restaurant and see that big red tomato, think of Amador and the fields where the tomato began its journey to your table.